Low real interest rates encourage investors to leverage their investments. As long as prices are rising or stable, this leverage results in higher returns. But if prices start to drop, it can lead to fire sales and insolvency. Therefore, you would hope that as asset prices rise investors might conclude that the risk of a collapse was rising as well and cut back on leverage. No such luck. 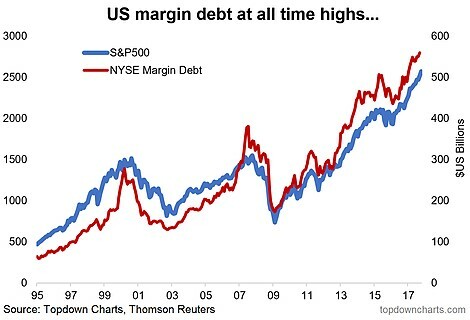 As the chart shows, the run-up in stock prices has been accompanied by a marked increase in leverage. If there is a sudden drop in prices, it could quickly turn into a route.